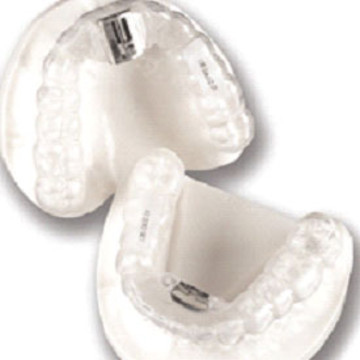 The TAP 3 is a mandibular advancement device for the treatment of snoring and sleep apnea. It is a custom-made, two-piece appliance that snaps firmly and comfortably over the upper and lower teeth, much like a sports mouth guard or retainer. Its basic function is to hold the jaw forward so the tongue and soft tissues of the throat do not collapse into the throat causing snoring and sleep apnea. The unique design allows the patient to adjust the degree to which the lower jaw is held forward, simultaneously allowing maximum comfort and effectiveness. The TAP 3 gives dentists numerous options to create the best, customized treatment solution for their patients. Interchangeable hooks can accommodate Class I, II, and III bites and increase the vertical distance between upper and lower teeth. As with any medical condition, it is recommended to consult with a trained sleep specialist before prescribing a sleep apnea appliance.